As pointed out in Chapter 1, the Simple Present tense may be used for stating general truths, and for referring to actions which occur at regular intervals. In the following examples, the verbs in the Simple Present tense are underlined. e.g. Nova Scotia is a Canadian province. Geese fly south every winter. 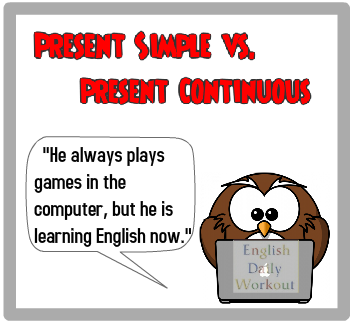 In contrast, the Present Continuous tense is usually used to refer to ongoing actions happening at the time of speaking or writing. In the following examples, the verbs in the Present Continuous tense are underlined. e.g. Right now, I am visiting the province of Nova Scotia. At the moment, a flock of geese is flying overhead. Right now, he is being ridiculous. She drives to Sydney every weekend.